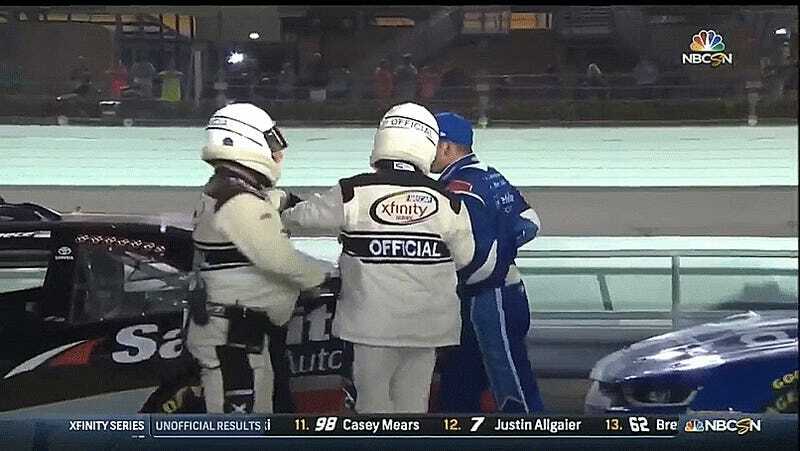 There’s losing with grace, and then there’s Elliott Sadler tonight, who narrowly missed out on the NASCAR Xfinity Series championship at Homestead-Miami tonight. Sadler was especially frustrated with Ryan Preece, who he made contact with on track trying to get by. So, he tried to pick a fight with Preece on pit lane. Sadler, of course, was one of the final four in Xfinity’s playoffs competing for the 2017 title. Sadler’s race started to get messy when he made contact with his JR Motorsports teammate (and eventual 2017 Xfinity Champion) William Byron during the final moments of the race. Sadler briefly made it ahead of Byron, but Byron eventually worked his way back around in front with just six laps to go. Byron then got stuck behind Ryan Preece. Sadler had to get by Preece to keep fighting for the lead in the race’s final few laps, but Preece wasn’t going to let him by easily. Preece told NBC Sports’ commentary team after the race that he was trying to score as many points as possible to get Joe Gibbs Racing an owner’s championship for the year. Sadler made contact with the rear end of Preece’s car, but Preece was able to keep control of his car and stay ahead for the moment. Meanwhile, Sadler radioed in that his tire was damaged by the contact and slowed down accordingly. Cole Custer ultimately won the race—his first Xfinity Series win ever—and Byron cruised home to win the 2017 season title. But the real fireworks were in the pit lane fight that almost happened, had some quick-acting officials not held Sadler back from a fight. “I should have took care of business when I got to Ryan,” Sadler continued. Man, chill. Stuff happens. That’s racing. Ultimately, the No. 22 car won the 2017 owners’ championship, anyway, so neither driver got what they wanted there. Nineteen-year-old Byron’s Xfinity Series title is the first for JR Motorsports—the team owned by beloved retiring Cup Series driver Dale Earnhardt Jr.—since 2014. UPDATE [11/19]: Here’s another angle of the kerfluffle-let from a fan, posted by NASCAR.